Altar servers help at Mass from beginning to end. They make sure the church is ready, are part of the opening procession, help the priest all through Mass, process out at the end, then help put things away after Mass. They really get to know the Mass! To be an altar server, you must have already made First Communion. We train new servers year round. This is definitely for you! To be an altar server contact Madison Daniel through the Church Office at (912) 437-4750. Lectors read the first and second readings, the petitions (prayers of the faithful) and sometimes the responsorial psalm. To be a lector, you must have been confirmed in the Catholic Church and have had some training. Contact the Church office for more information at (912) 437-4750. Greeters are also called ushers or ministers of hospitality. Since ancient times, they have made members feel welcome as they arrive, helped guests find their way around, and made sure things go smoothly. At Nativity, they also take up the collection and make sure the offertory procession takes place. To be a Greeter, you must have been confirmed in the Catholic Church and have had some training. For more information, contact the Church office for more information at (912) 437-4750. Extraordinary ministers of Holy Communion distribute the precious body and blood of Jesus to the congregation. There are also extraordinary ministers who are authorized to bring communion to the sick. To be a Eucharistic minister, you must have been confirmed in the Catholic Church, have had appropriate training and be authorized by the pastor or bishop. ​For more information, call Nadine at the church office (912) 437-4750. Jesus' Housekeepers make sure our church is beautiful! They clean our worship area, take care of the sacred vessels and linens, and generally make sure that the people have a pleasant place to celebrate the sacraments. The sacristans prepare for each liturgy. Our flower ministry is coordinated by volunteers. Nativity Church's Liturgy Commission meets several times a year to coordinate big feasts and seasons like Advent, Christmas, Lent and Easter. The commission guides a coordinates our liturgical decisions and policies. They are also charged with making sure that our liturgies are worthy and proper. 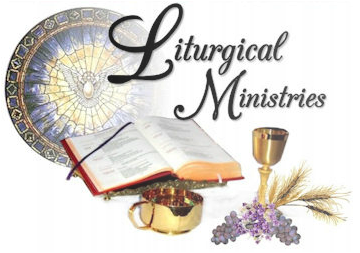 The Liturgy Commission consists of representatives from among the readers, altar servers, choir, greeters, Eucharistic ministers, housekeepers, sacristans, flower coordinators, the president of the pastoral council and Fr. Tim.